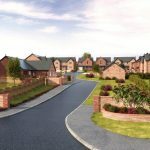 Our current developments are located in and around two of the most sought-after residential villages in Cumbria – Cumwhinton and Wetheral. The delightful hamlet of Wetheral Pasture is the location of our superb new development of just five new 5/6-bedroom detached executive homes finished to the highest specification and with the trademark Magnus Homes emphasis on attention to detail. Carlisle, with its railway station on the West Coast mainline, is 10 minutes away and with excellent road links for the M6 and A69 there is good access to The Eden Valley and The Lake District. Thornedge in Cumwhinton features 39 new properties in a rural setting close to Carlisle. Lime House Gardens in Wetheral features only 6 properties individually designed to make full use of traditional local materials. The development of Lime House Apartments has seen this landmark historical building beautifully converted to create 9 stylish apartments overlooking the village green. Below is a list of our current developments that are either still under construction or have properties available for sale today! For more information on each development, please click on the development title or image.